About Yourself: ITS YA BOY DAGGER HERE, IM TRYN TO PWN NEWBZ AND EAT CEREAL IN MY UNDERWEAR WITH YALL BOYZ. How many Hrs a day you play: I hop on and solo pk for a couple hours here and there. 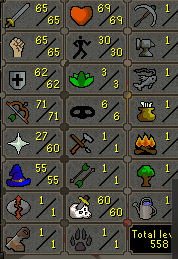 During DMM seasonal I play 7-12 hours a day. Why do you want to join Anonymous Community: Brotherhood. How did you hear about us? : I was recruited to join the CC "AC HOME" by one of the anons...darn I wish I knew which one. Have you played DMM Before? Yes I've played every seasonal except maybe 2 or 3. Do you know anyone in Anonymous Community,If so whom: I don't know which anon unfortunately..I always got the alchs for my boy Moistening though! Location & Timezone: GMT+1 (Malta) - Time wown't be an issue. How many Hrs a day you play: 10 Hours give or take. Have you played DMM Before? Yes, 3rd Season. Location & Timezone: GMT+2 (currently deployed in Bulgaria) From eastern time zone. About Yourself: Military job, been an active member of the pure community for about 10 years, retired member of clan FOE. I love to pk. Why do you want to join Anonymous Community: Well, I bought some gold off of lilshagg26x, and I forgot the name but one of your ranks actually did the trade. I wanted to show my trust in you guys, so I went first, trading 30m osrs gp, and after that he traded me 2.1m dmm gp. I was very glad to see legit members of the community still exist, and that is what I would like to be a part of. How did you hear about us? : I originally heard of you guys in the very first version of DMM, before it became just w45. Have you played DMM Before? This is my first season, but I played the original version for about 5 months. List all names you had in DMM: Weekend Fap, Who got me, and Hardly me was my name on the original DMM. Do you know anyone in Anonymous Community,If so whom: So far, just the guys I have met in the cc, I have also swapped with 4 guys from the CC one being a rank. I have had 3 deaths on sdmm so far, so these are my current stats. I also have about a 7m Bank. About Yourself: My names nathan and i work at the airport.